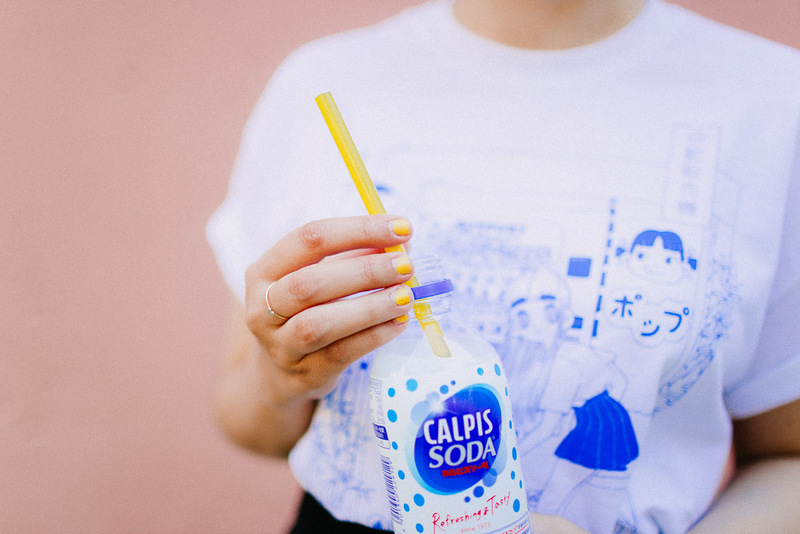 More Calpis soda fans out here? I just got this t-shirt from a local artist (very local! 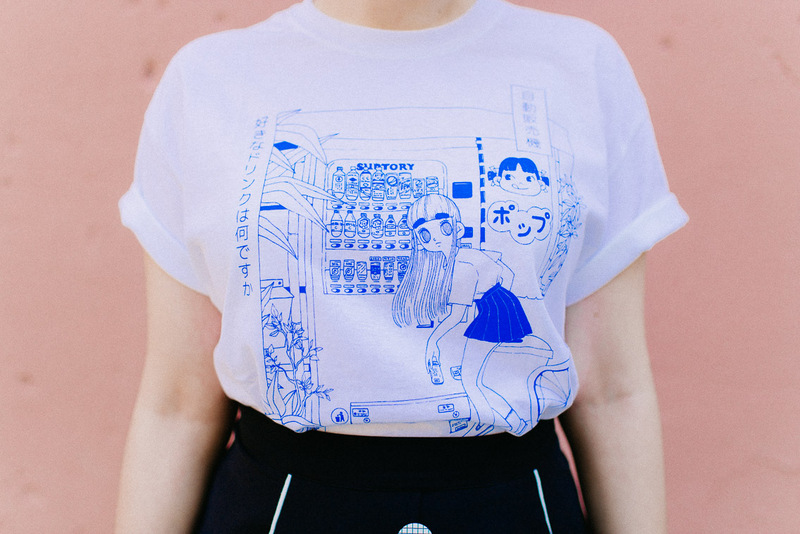 she is also from Barcelona) called Oh Caroool that sells prints, apparel, patches and pins inspired by the Japanese culture. 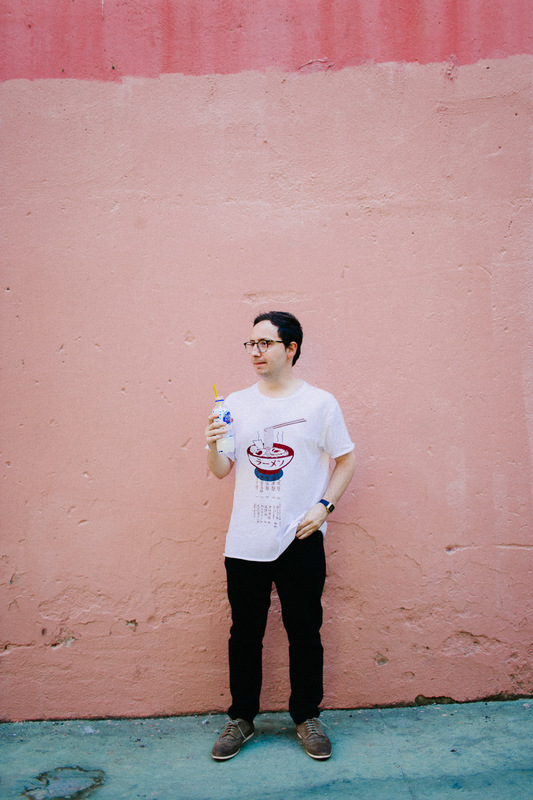 When I saw the Japanese vending machine, screen printed on the t-shirt, it was love at first sight. It may sound silly, but I think everyone who has travelled to Japan has a vivid memory of the machines spreading everywhere, even on top of a sacred mountain, temples or remote towns. I got a size M but I think an S would fit me as well, I was only cautious because I don’t like super fitted clothes. On our honeymoon, a vending machine was the first thing in the airport that made me realize that I was in Japan, that it was all true. 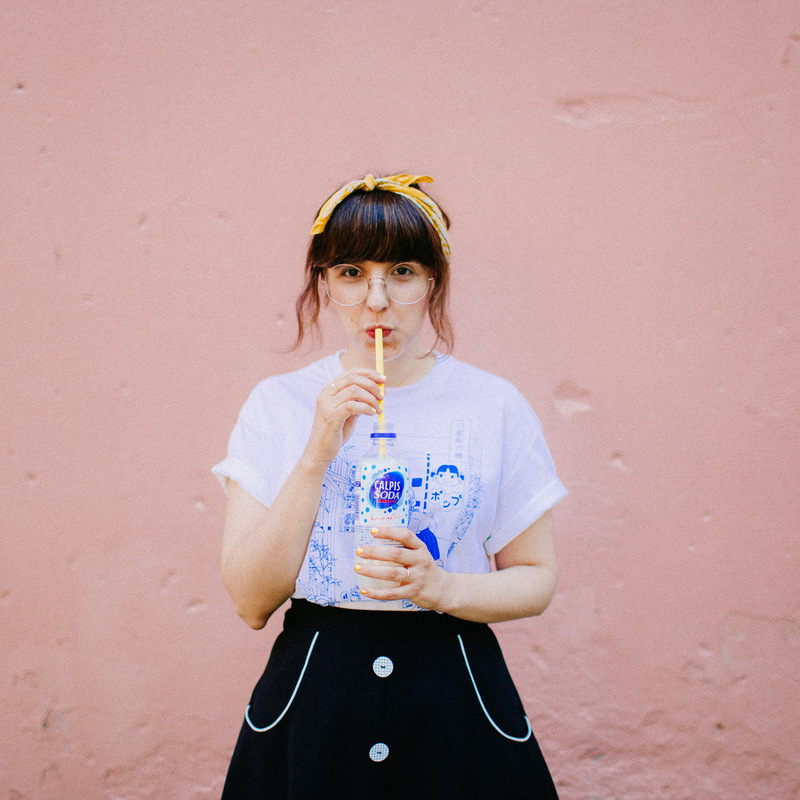 I remember that we just recently had changed our euros for yens (also in the airport), and hardly was able to recognize the coins, but looked jet-lagged and excited into our purse and bought a lemony soda. We love trying new foods and drinks, so I guess it’s extra exciting to have that possibility at hand. Also, it is super useful, this last time I travelled with a cold, and being able to buy hot ginger tea almost everywhere helped me a lot to be able to keep with the walking a travel requires. However, we didn’t discovered Calpis in Japan: we tasted it for the first time in our favorite Japanese café here in Barcelona. 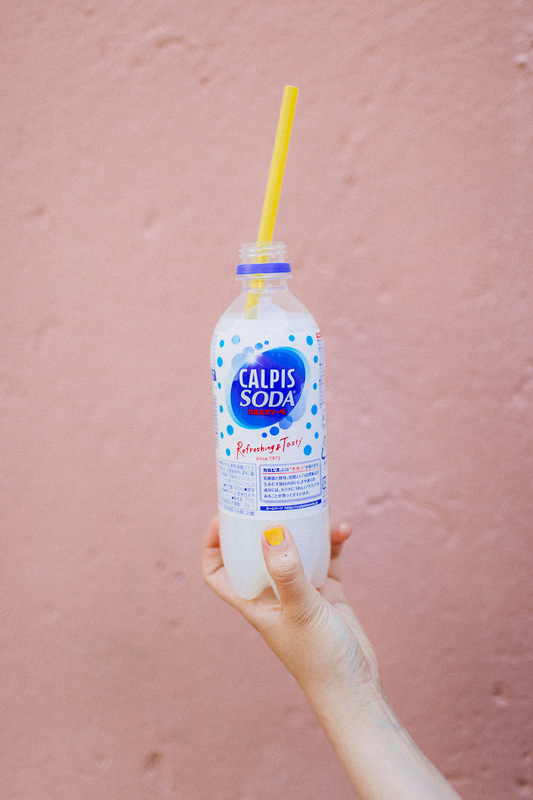 When we asked what the “Calpis soda” thing from the menu was, I remember she replied that it was a soda with a milk flavour, and we loved it! I really don’t know how it would be better to describe the taste, it has this milky texture but it’s also sour or acid. On our second trip, we were already addicted, so also tried it in Japan from the vending machines. 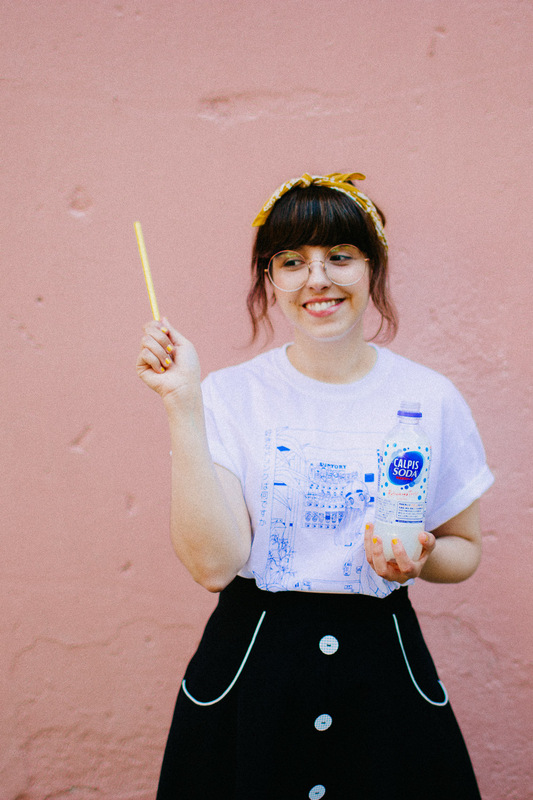 We found more options: Calpis without soda and others with little square jellies. 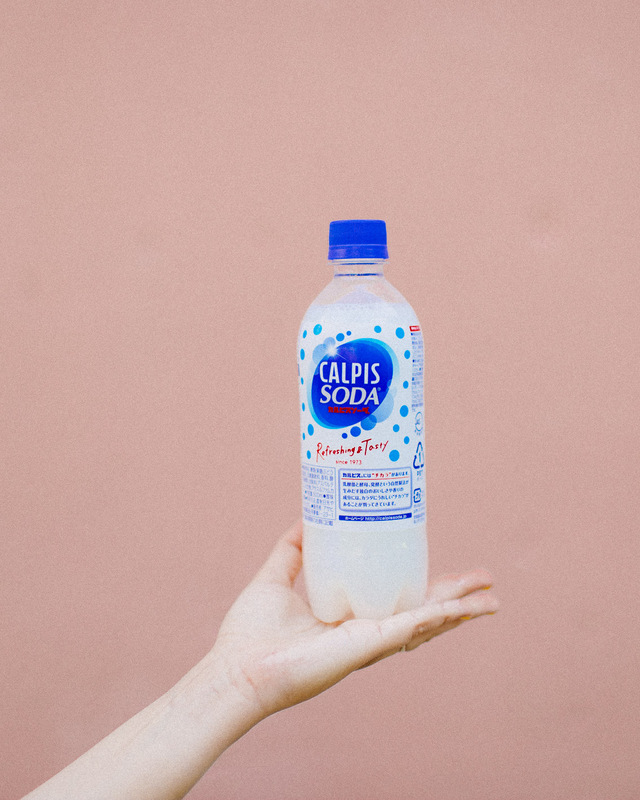 Have you ever tried Calpis? 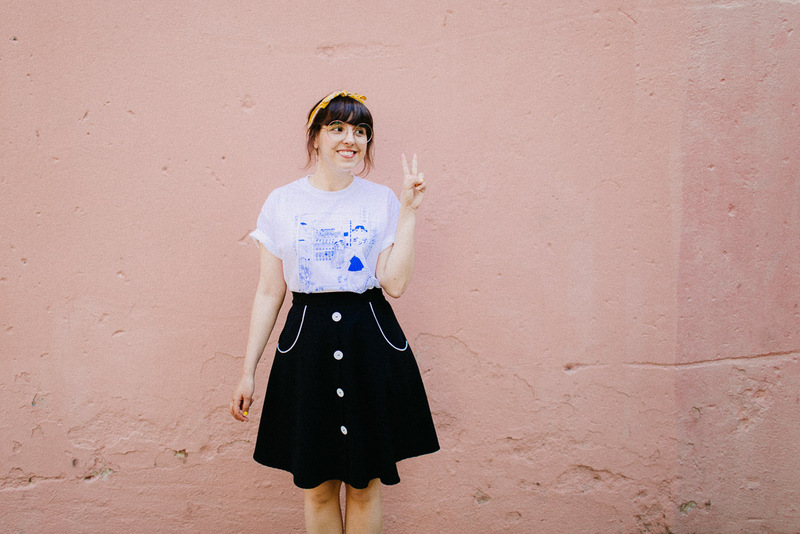 I got the skirt in Madrid from a local store called Lady Cacahuete (means lady peanut, ha!) 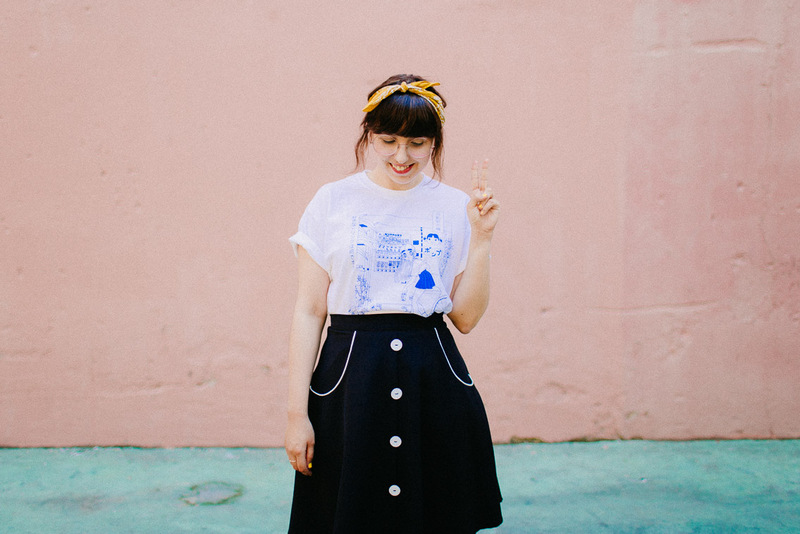 that sells 50s inspired pieces that are designed, cut and sewn by them just right there. 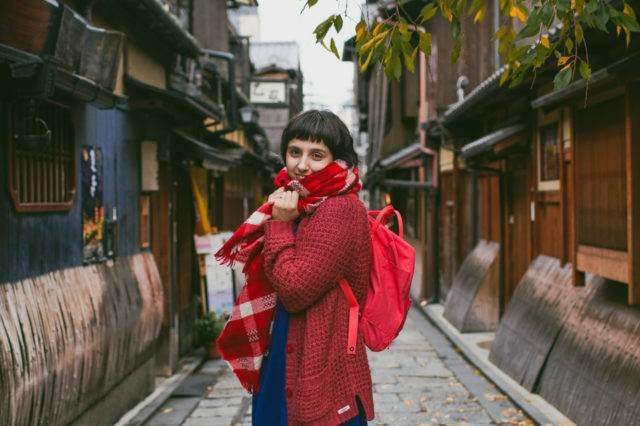 The cosy store in Malasaña is a must if you ever visit Madrid, but they also sell online, so you can check everything out. If our wedding was right now, their Princesa Margarita dress would definitely be a BIG contender. 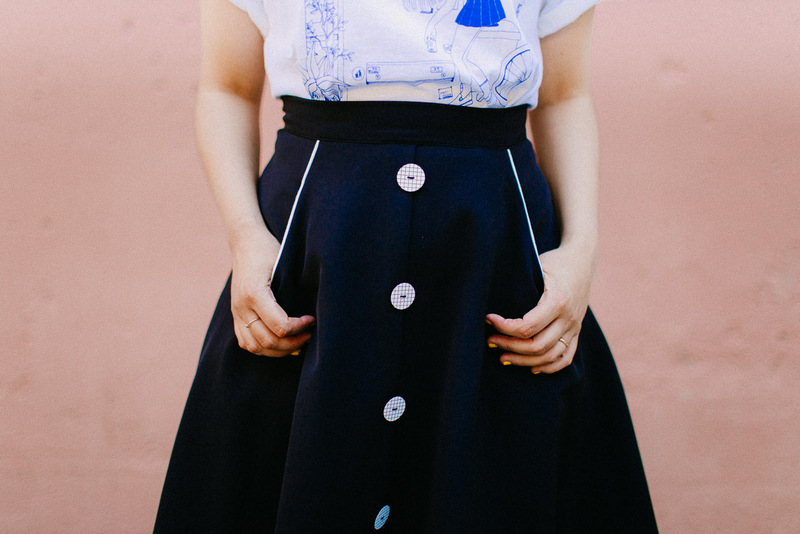 I also love their sizing approach, similar to Modcloth. Although it is more American style cut, I think it makes a good match with the t-shirt, as it could resonate as a student uniform skirt. For the head scarf hair do, I took inspiration from the Hello my Twenties, a K-drama series I have been guilty-pleasure watching on Netflix. Oh! And in case you noticed something different around my eyes, I wear prescription glasses. My graduation is low and the doctor told me that I should not use them on daily basis to avoid my eyes getting lazier and lose sight. I use them when I’ve been a lot of time in front of a computer and my eyes are tired, then I allow them to be lazy *wink*. Daniel and my mom got me this super big gold rose glasses that I love but I know they can look a little bit crazy. I wish this was a magic wand, instead of a regular straw, and that I could instant-trasnsport myself to Japan. 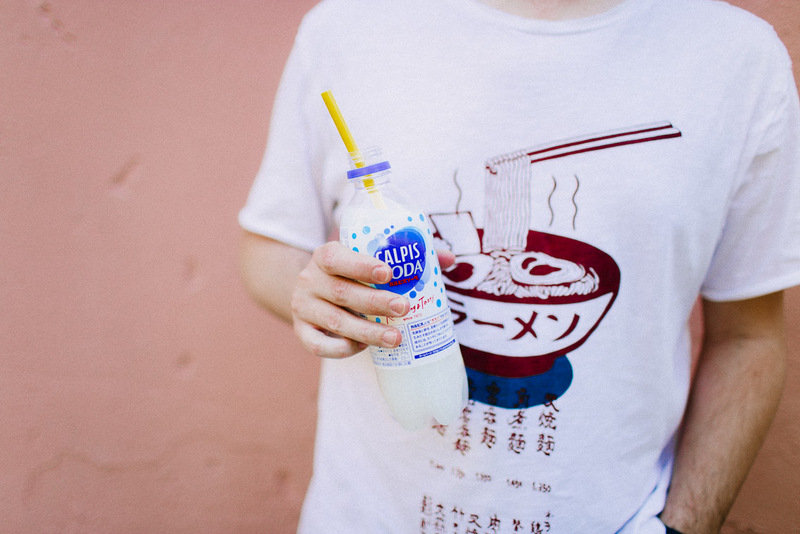 But hey, for the time being, I am glad to be able to sip Calpis when I feel more nostalgic. Which is your favorite drink? Japanese or not! I would love to discover new things to try. Also, talking about being crazy for snacks, do you remember our Japanese snacks video, where we took a picture of every snack we ate during our honeymoon? In case you miss it, here we leave the link so you can discover how foodie obsessive we can be, ha! 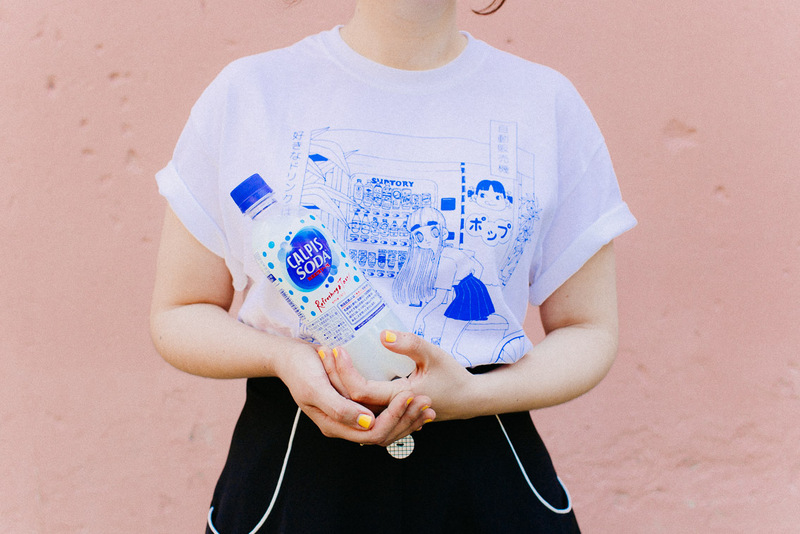 Yaaay a Calpis fan!! ☺️ thank you sweetie! The nails’ paint was Bourjois, I love the color, but I’m not very happy because they start chipping right away. I should find another brand, maybe Essie? Not sure! 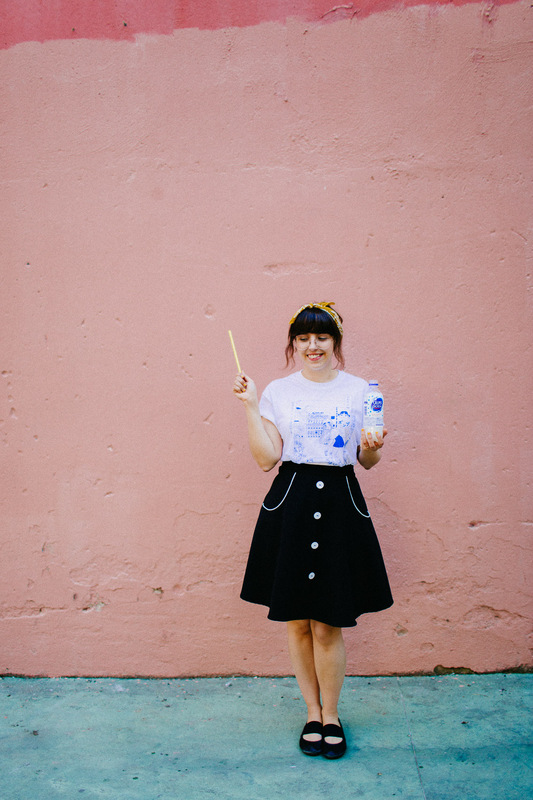 Oh my first thought was, Damaris you have turned into Kiki (or at least another cute anime character!) 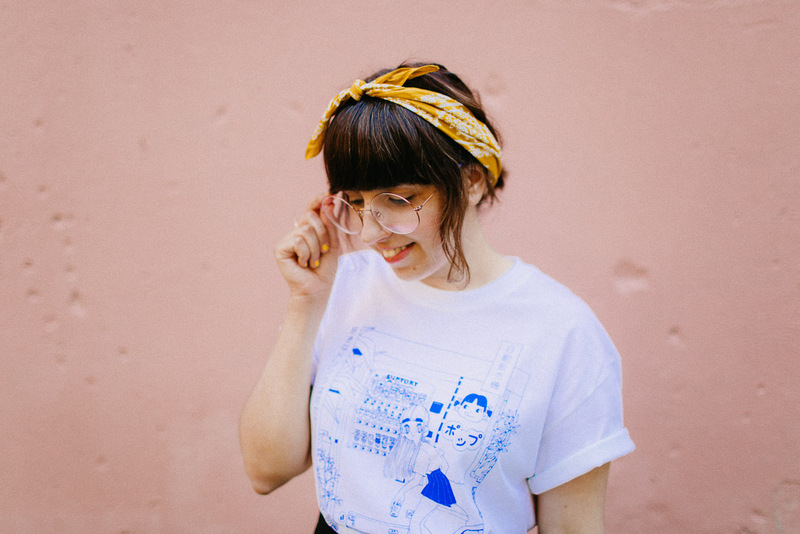 The tee is so cute and I love all the pairings – skirts, scarf and glasses! Dani is looking very dapper as well! Definitely a couple who belong in the Street magazine! Sencillamente guapísima. 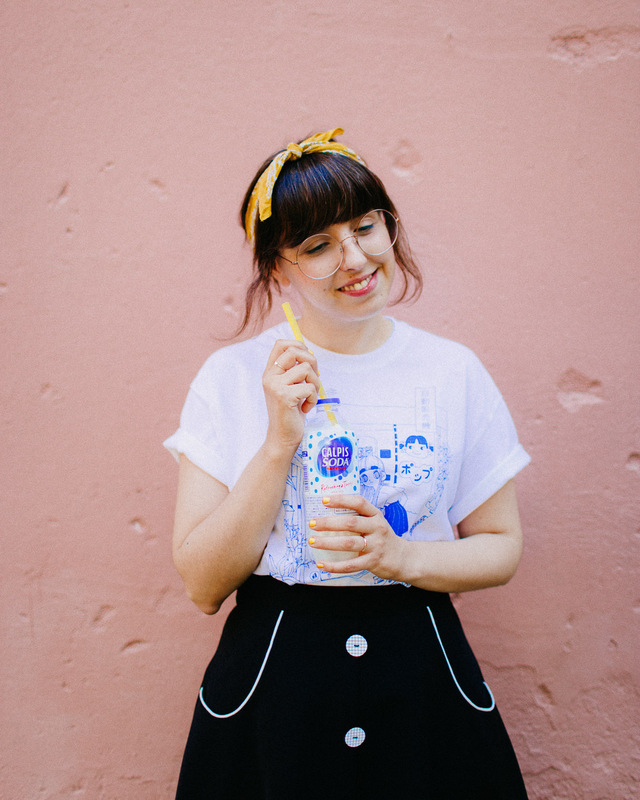 Me encantan la falda y la camiseta. Las fotos han quedado muy bien! I remember being obsessed with the band Judy and Mary and trying to download anything I could get my hands on of them. 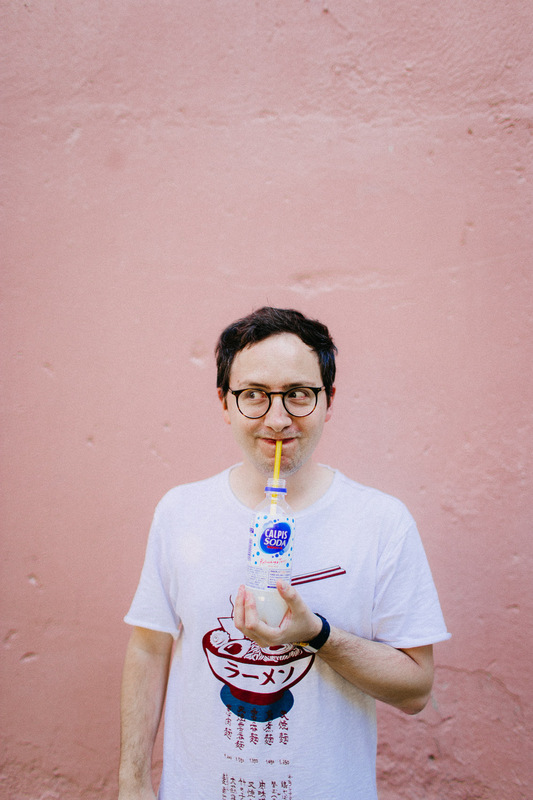 There was a calpis soda commerical that I watched over and over, but I am not a fan of the soda. It reminds me too much like someone spilt some yogurt in some seltzer. No thanks lol. Aah I follow her on instagram! 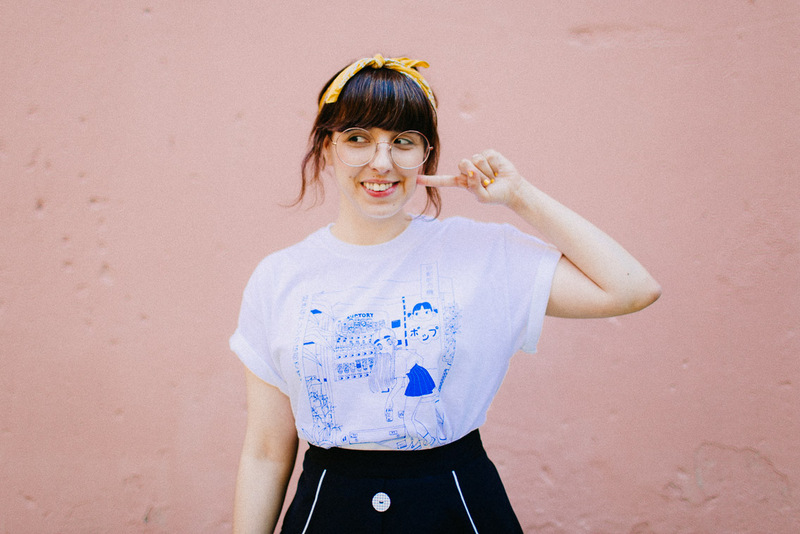 I absolutely ADORE her work, and have always wanted one of her tshirts. 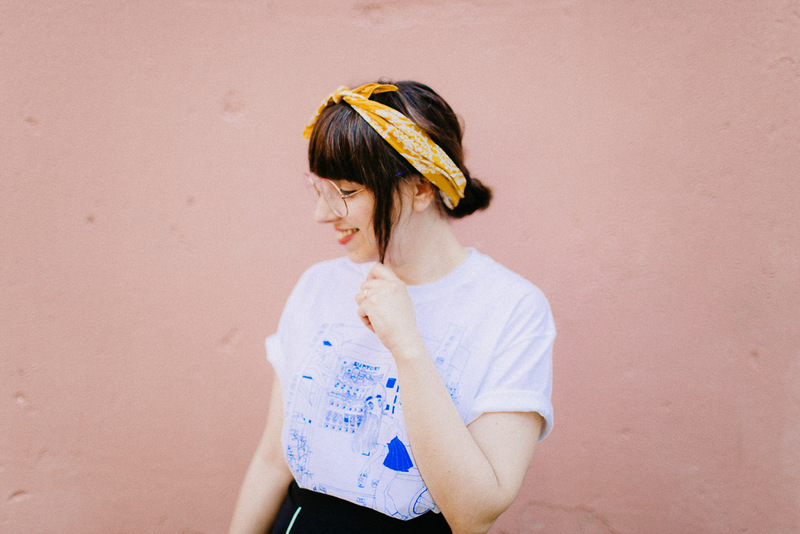 It’s so uplifting to see bloggers supporting local artists, and you’ve styled this so well! 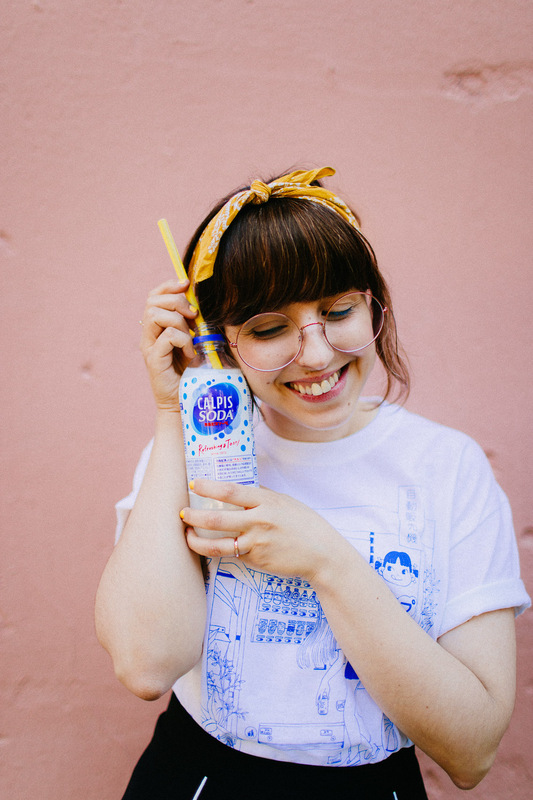 Btw I also love Calpis Soda and wish they sold them nearby (but I have to travel to London for that).